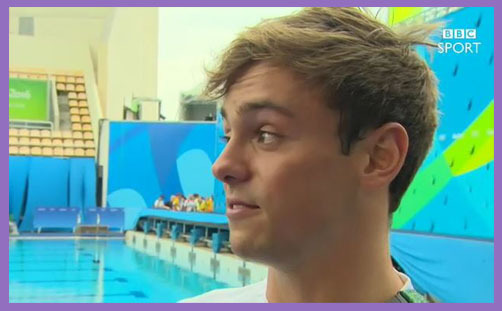 Tom Daley had already won a bronze medal for his synchronised 10m platform routine with Daniel Goodfellow. He then took first place in the Men’s 10m platform preliminaries, and hopes were high for Gold. But things went a bit wrong during the semi-final, and Tom Daley fell from first place to last, failing even to qualify for the chance to dive again, let alone win a medal. Bad hair day. One day you’re up; next day you’re down. Skubalon happens. You’d think a group calling itself ‘Christian Voice’ would ensure that their every utterance were, well.. Christian. This tweet was not only lacking in grace an compassion (the guy had just failed in front of the whole world, for Pete’s sake ; he was devastated, tearful and deeply upset), it was a sneery, spiteful tweet; callous, cruel and un-Christian. What manner of Christian voice trumpets crass theology to a man when he’s down? If “turning gay” caused Tom Daley to make a ‘gay dive‘, how come the openly bisexual Nicola Adams won not one but two Gold medals in boxing? How come Kate Richardson-Walsh and her wife Helen (yes, you’ve got it) won Gold in women’s hockey? 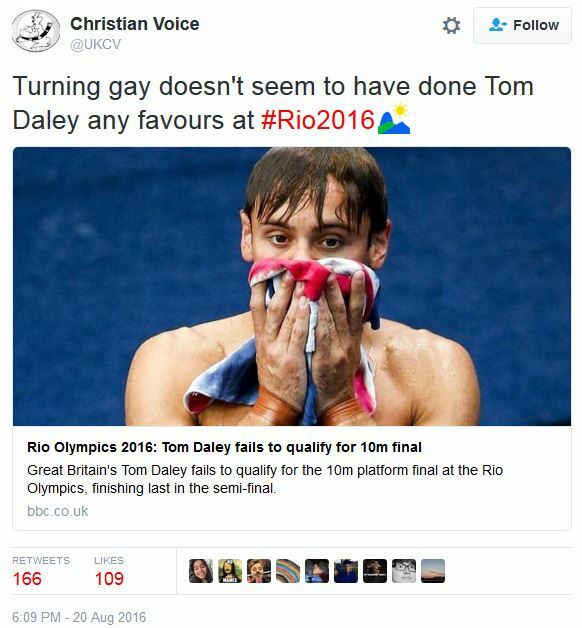 Could Christian Voice please explain why “turning gay” works for some but not others? Why does God shower some LGBT athletes with Gold, but leaves poor Tom a-cold and all alone on Pillicock Hill? Which does God hate most: homosexuality or Islam? Perhaps Christian Voice might expound why Mo Farah (that’s Mo as in Mohammed [yes, you’ve got it]) wins the ‘double-double’ 10,000m and 5,000m twice; and Muslims like Sara Ahmed and Ibtihaj Muhammad make history for their nations. Does turning Muslim bring more divine blessing than turning gay? Mo Farah normally prays before a race, and falls down on the track to thank Allah for giving him victory. Why would God honour such blatant idolatry with a double-double gold medal? And what about fornicating and adulterous athletes? They slog away day-in, day-out for four long years, just like Tom Daley, and then they triumph in moments of glory; their sexual sin of no apparent consequence at all. The theological worldview of Christian Voice appears to be one in which idolaters, adulterers and fornicators are given a pass by God to win gold; and homosexuals, lesbians and bisexuals are given the same pass, except if they’re named Tom, who seems to merit particular opprobrium. Perhaps Christian Voice might explain why. Is it because of his celebrity? Is it because he’s something of a role model or ambassador for young gay people? Wouldn’t these be rather asinine reasons for singling out one young, gay diver for particular judgment, while leaving the gay boxers, swimmers, equestrians and discus-throwers to glory in their gold or wallow in their loss? How is that just or fair? Surely if you’re going to proclaim God’s message of sexual morality, you need to ensure that there is no prejudice in your preaching; no soteriological favouritism or ethical preference for male or female; Jew or Greek; diver or gymnast. Why hasn’t Christian Voice been, well.. more Christian and egalitarian in its judgments? Christian Voice is just plain wrong. Their grasp of cause-and-effect sin-and-judgment is so crass as to be not only unkind and uncompassionate, but egregiously un-biblical and so un-Christian. The most cursory reading of the Psalms, Ecclesiastes and the Book of Job would point them the right way, but Christian Voice has set itself up as pope of doctrinal exposition and the authoritative magisterium on all questions of morality: Stephen Green is apparently preserved from error (though divorce is apparently permitted). Jesus answered, Neither hath this man sinned, nor his parents: but that the works of God should be made manifest in him. (Jn 9:1-3). I tell you, Nay.. (Lk 13:4f). There is a vanity which is done upon the earth; that there be just men, unto whom it happeneth according to the work of the wicked; again, there be wicked men, to whom it happeneth according to the work of the righteous (Eccl 8:14). Christian Voice would do well to reflect on this, for God’s punishments and rewards are rarely, if ever, in proportion to man’s sin or righteousness. Tom Daley’s experience moves him beyond crass theologies and limiting apprehensions of wisdom: perhaps “turning gay” is preferable to being one of Job’s dogmatic, unfeeling comforters.